Oh, how I envy you and your spring blooms. We are still in the mud season with all its grays and browns. Hardly any green at all let alone the color of a wildflower. Thanks for sharing some of your color, Linda. Much needed. I looked in at the Cornell bird cam in Ithaca, and see what you mean. Despite the relative warmth and plenty of birdsong, there’s not a hint of real spring. The pond is ice-free, but of course that only means more mud. My biggest problem right now is deciding which of the color to show first. They’ll be plenty more to please your eye in the coming days. If red, white, and blue together represent us, who, I wondered, is represented by your three colors? Turns out Colombia’s flag has a double-wide yellow stripe across the top, beneath which is a blue stripe and then a red one. When I looked at the colors together, I thought of two things: the red, yellow, and blue finger paints we used as children, and the red, yellow, and blue chairs that made up my first grade reading circle. Who knows? Maybe that early emphasis on primary colors influenced my selection of these photos. If a flag were proposed for the country of childhood, I’d vote for it to contain these colors. “The country of childhood” is an elegant phrase. 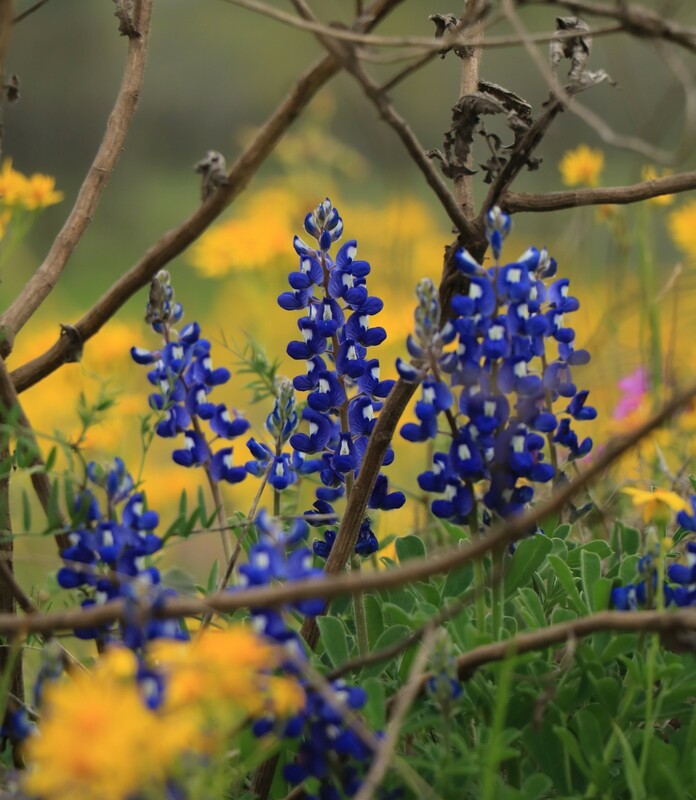 Viewing Texas wildflowers is a great way to wake up in the morning. Isn’t it, though? I picked up a pretty mug for my aunt at HEB this morning. It’s encircled with bluebonnets (of course), bluebells, coneflowers, and gaillardia. There was only one left, and I asked a nearby clerk if there might be more in the back room. She laughed and said no. All of the dishes, glassware, and little accessory pieces that sported the wildflowers had sold out, and she didn’t know if more would be coming in. The appeal seems to be widespread. I saw them. Ours are gone too. I like the second picture most, because, with the fence in it, it is so archetypical Texas. I love fences, too — and fence posts. In fact, I’ve thought of a post filled with posts. When I finally do one, I’ll certainly post about it! I love flowers in every sort of way — individually, or in fields, or in bouquets — and these seemed to me very much like bouquets: not from-the-florist bouquets, but the kind we might have picked for our mothers or friends when we were young. We have the Indian paintbrush here, but it’s not that stunning. One has to really look for it in order to notice it. Your photo captures the true beauty – but all of these photos are beautiful! One of the tricks to seeing our wildflowers is getting out before the grasses grow so tall that they hide the flowers. That happened to me last year with our bluebells. I went back to take more photos after a space of about four days, and that was too long; they were already hidden away. I was lucky with the paintbrush; the proportion of grasses to flowers seemed just right. I’m surprised that the grasses don’t choke out the flowers, but Nature’s pecking order takes care of those details! Yes, they look as if they’ve been arranged by a designer! Such beauties! Spring is still a few weeks away here, but I’m seeing signs. Little ones, but signs nonetheless, and you can see what a difference they’re making when you realize how many people are smiling not frowning! The same thing happened here when the rain finally stopped, and the fog lifted, and the clouds went away. People not only were smiling, they were letting one another into traffic. It was marvelous to behold. Little signs are still signs, after all. I’ve seen midwesterners talking about buds on trees, and even a few crocuses and tulips. Is there any green in your grass yet? Maybe a stray dandelion? I do hope so — not only for your sake, but for Dallas’s, too. Oh, the grass is really greening up. Now, if we could just have a week or so of sunny days so all this wet can dry!! That’s a really nice set of photos. Honestly, you should frame them and hang them! The structural elements combined with the color elements is just perfect! I thought the set did come together well. Originally, it was the bluebonnet photo that brought the word ‘tangle’ to mind. 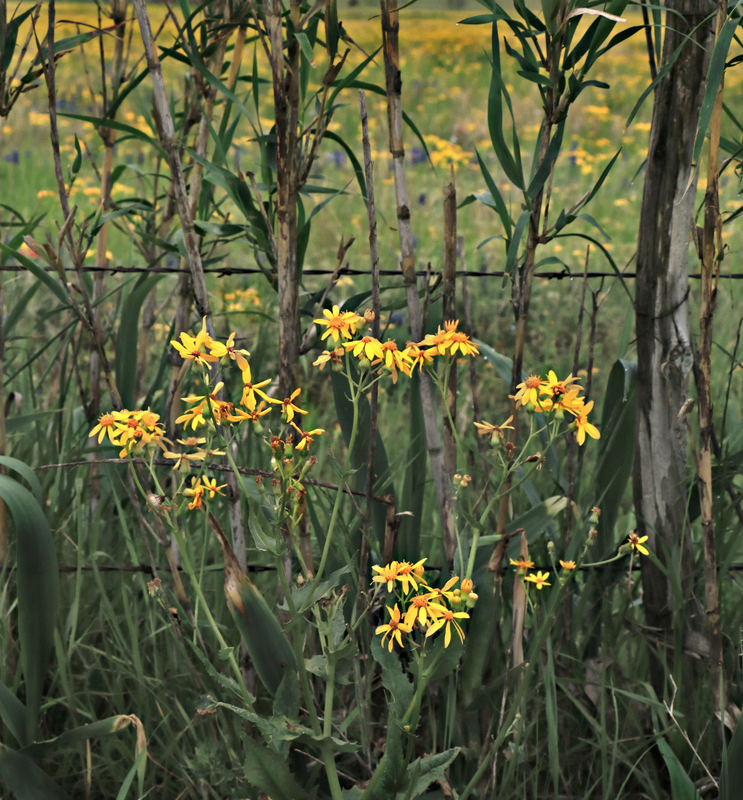 I wondered if I had any others that would show that quality, and found the paintbrush and ragwort. When I realized that they also represented the three primary colors, it was even better. It pleases me that you like them. As you could guess, I prefer loose arrangements to formality, and fencelines are a great source of originality. I’m enjoying your spring, thank you. There’s a few native blooms showing their faces now that summer has passed, and a little rain about. Love that second image especially. I took that second photo early in the morning on a cloudy day. In fact, when I stopped in that spot to photograph a field, it was so cloudy and dark, I decided to focus on things closer at hand. That’s when I found this little fenceline scene, some white paintbrush, a few big, fat buttercups, and a pretty ‘something’ I still haven’t identified. Like you, I enjoy fencelines, except when I forget how sharp new barbed wire can be. In truth, new and sharp is better than old and rusty, but it’s still best avoided. I have been enjoying seeing your springtime: ours hasn’t really started yet. No, I imagine you’re a few weeks behind, at least as far as plants are concerned. On the other hand, Louis and Iris are back in Missoula, ready to fish the Clark Fork River and raise a new brood. They just got back last week — right on schedule. They’re great fun to watch, especially since the camera’s so good. I would certainly like to spend some time getting to know your fence rows and roadside wildness. Pristine beauty certainly is to be admired but, as you’ve shown, the somewhat less than pristine has much to offer as well. Some of the richest collections of plants lie along our fencelines and in our ditches. While they aren’t as immediately eye-catching as the larger spreads of color, the variety is wonderful. That’s why I enjoy the cemeteries, too. They may have a few species that predominate, but there’s generally at least some mixing it up. Many people stick to the main highways when they go out to look at the wildflowers, and there certainly are sights to see. But some of those sights have been helped along by plantings done by the highway department: hence, long stretches of paintbrush, monarda, or coneflower. But out on the county roads or farm-to-market roads, patches of ‘whatever’ will pop up, and there’s much less predictability. It truly is like a treasure hunt. Noticed a good stand of what we called spear grass as kids – we knew the end of school was close when that appeared on the playgrounds, back when we could run around wild and utilized the spear grass. Never knew anyone who got their eye stabbed out…but lots of squeals…everyone liked to see the little wild flowers – everyone took time to look at them. Now that’s recess! Like the way you tipped people off to the flowers’ chatter – they do have personalities and chatter. Dressed to impress, for sure. I missed the police in the bluebonnets, but I’ve seen people taking photos among the flowers. The best accomodation I’ve seen for the babies-in-bluebonnets enthusiasts are the small plots of flowers provided for just that purpose at Wildseed Farms in Fredericksburg. It helps people avoid the temptation to head for the big fields and trample the flowers there. A friend was telling me recently about her spear grass experiences as a kid. We were denied that pleasure in the midwest — I remember it as a much gentler environment. But we took time to look, and pluck, and enjoy, especially after months of snow. Eavesdropping on wildflowers — or birds, or frogs, or trees — is a perfectly satisfying way to spend an afternoon, especially since they’re not at all shy about expressing themselves. Those are wonderful — a lot of good-natured humor to go along with the pretty flowers. You had to love the images of the canine officers! Of course the canine officers look the best! Would that people were more like wild flowers who don’t mind that the flower blooming next to them is a different color. Brought to mind that wonderful Dolly Parton song of the same name from one of those priceless Trio albums she did with Linda Ronstadt and Marylou Harris. Three wonderful voices raised in perfect harmony. https://www.youtube.com/watch?v=7NX9UuRyt0E in case you’re interested. . . .
Isn’t that just the truth? I’ve yet to come across a bluebonnet offended by the presence of an Indian paintbrush, or a sunflower sulking over the primroses’ taking over the neighborhood. I can’t believe I’ve not heard that song, especially since I enjoy the work those three have done together. What a great song — and just right for Dolly, I’d say. I always enjoy hearing Emmylou, too. Her “Born to Run” has a lot in common with the trio’s wildflower song. I’m glad more people are using these pretty and natural wildflowers in their gardens. I’ll always admire formal gardens, but I love this kind of discovery — and I’ll do my best to protect them from those predators! These are all very nice shots, but I like that first one the best, shooting through the grasses. It gives it nice depth, and I think sometimes we appreciate things more, when we just get a taste, and not the whole enchilada. I really enjoyed finding that 50/50 split between the flowers and the grasses. 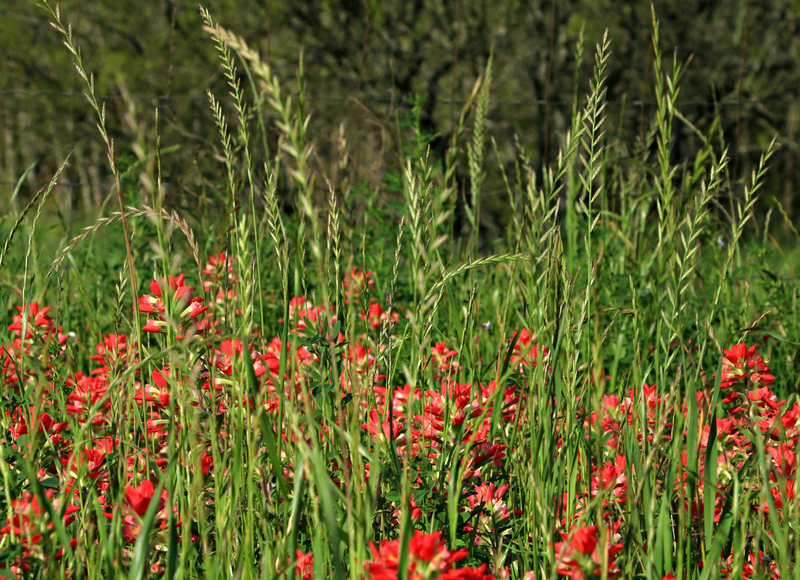 It could just as easily be a photo focused on the grass, with the Indian paintbrush as supporting cast. Getting just a taste of spring is pretty hard here right now. She keeps shoveling out plates loaded with enchiladas — it’s almost overwhelming. Totally beautiful — Texas in Technicolor and that bright, beautiful combination of colors certainly must mean spring is here to stay! Just for grins, look at this Texas forecast: “Temperatures in the 80s, 90s, and 100s Wednesday. Wind-storm with 70 MPH winds and extreme wildfire threat on Wednesday for western 1/3rd of TX. Rain/storms Friday Night/Saturday – with snow Sat. morning in the Panhandle.” Spring in Texas: it’s not all wildflowers and bunnies! But it is beautiful, and there’s more to come as we transition into summer. I just hope you’re transitioning into spring! I’ve become accustomed to finding what I call my ‘ditch diamonds’ in the spring — various water loving plants like spider lilies. But this collection of delights was something else. I can’t remember ever seeing such a variety along the road, including one or two I’ve never seen before, and have yet to feature. It’s been a wonderful spring!